So you know what I discovered the other weekend. How much I love Lindt chocolate. I've never liked Lindt before, and I have to admit I still don't particularly like some of their products, but the Lindt Excellence range is fantastic. The chocolate is deliciously thin, breaks off perfectly and is packed with flavour. So far I've tried 80% cocoa, strawberry intense and coconut intense. I absolutely loved all of them. I can't wait to try some others - 70% cocoa, sea salt, passionfruit intense, roasted almond, crunchy caramel and madagascar. Maybe even the blueberry flavour. Anyway, this has two points. One: if you don't like regular Lindt products like me, try their Lindt Excellence range. You will love it. Second: I am very lucky. I am very lucky that I have had a good life, was born into a kind and caring family and my parents have the ability to support me through uni. I am very lucky that because of this I have managed to save enough money to go overseas this year. I am very lucky that I scrape through good grades. I am very lucky that I have the most amazing two roommates ever and we live in a fabulous apartment. I am very lucky that I can afford to buy myself good food and eat out sometimes. I am very lucky that I was born me. So I guess what I'm trying to say is, thanks, to whoever is listening, for making my life good. Whenever I have bad days (I had a shocker the other day), I've just got to remember; I am lucky. What are you guys thankful for? And, onto the less serious topic of food. I suppose I got thinking about how grateful I am when I was writing this because this post has some great examples of why I am lucky; good food, some of it rather expensive, good friends, good apartment. 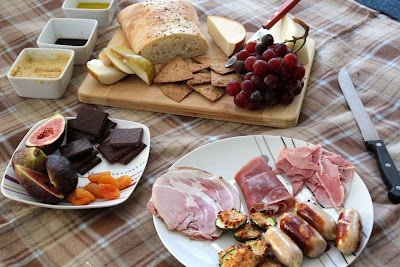 The other week we made this amazing snack / antipasti plate and turned it into our dinner. We ate it on our balcony, we didn't watch tv and we even played a game together. That doesn't happen often. And it was the best night I've had in ages. So today I thought I would talk about my kind of snack plate and how I put one together. In case you care. 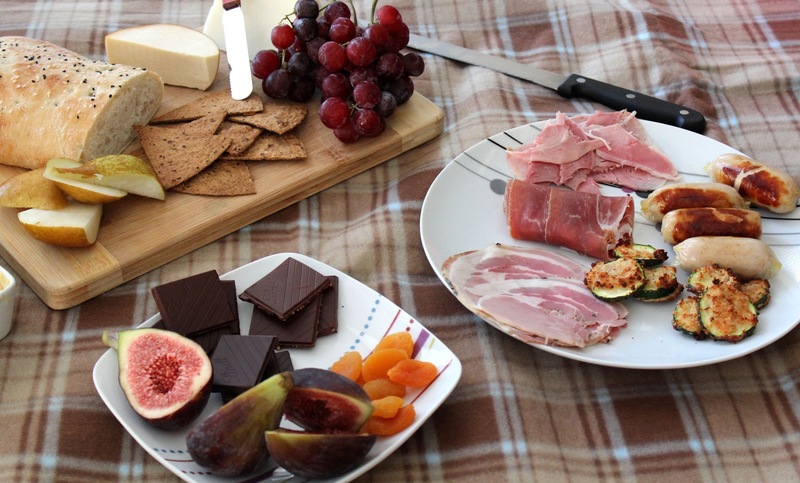 I like to have three parts to my antipasti - bread and cheese, meats, and dessert. I find fruit overlaps on all of these parts. So for the bread and cheese plate, I like to have two types of cheese - one hard, one soft. Here we had two of my favourite cheeses: Dutch Smoked Gouda and Primosale Pecorino. You can tell I'm Dutch and Italian. 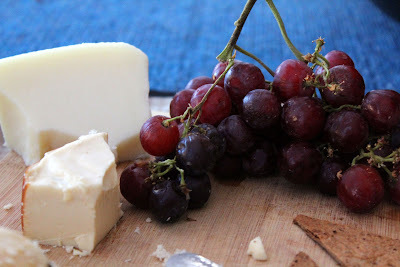 The Gouda, while not too soft like Brie, was still soft and contrasted with the hard tang of the Pecorino. I think that's a great thing to do - two opposing cheeses. 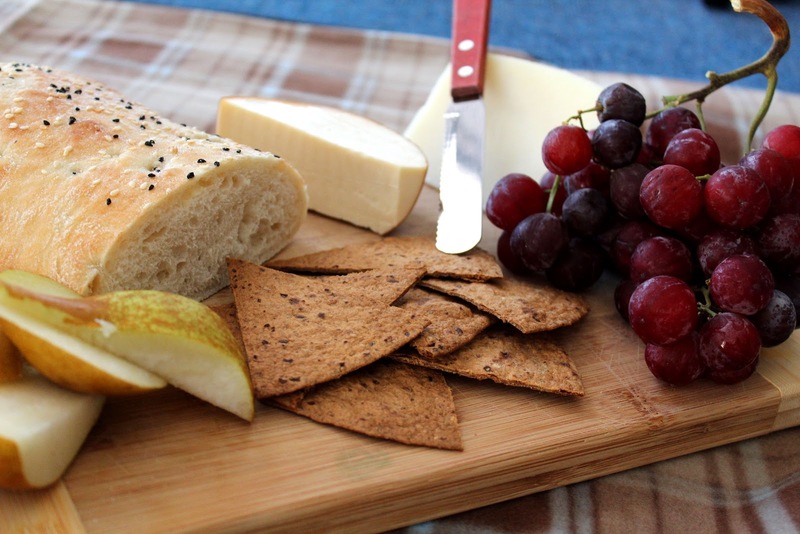 I also like to have two types of bread - here we had Turkish bread and homemade tortilla chips. To make the chips I simply sliced up a wholemeal tortilla and baked them - next time I'll be flavouring them! We combined these cheeses and breads with two classic fruits - pear and grapes. You just can't go wrong. On the side I had olive oil, balsamic vinegar and hummus for dipping - I was the only one who dunked my bread in the oil and vinegar. My roommates thought I was crazy. But again, I'm Italian. Oil and bread go together (though this is not technically an Italian tradition, lots of people believe it is). Then we had our meats tray. 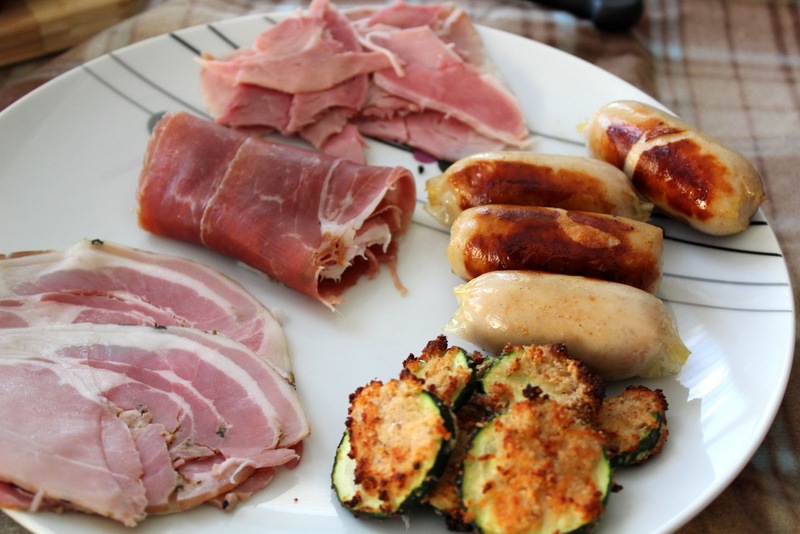 I like to have a bunch of different meat, not just from the same animal if possible, so that way there is a variety of flavours. For this plate we had rosemary pancetta, proscuitto, ham from the bone, veal sausages and zucchini fries (though not cut like fries). 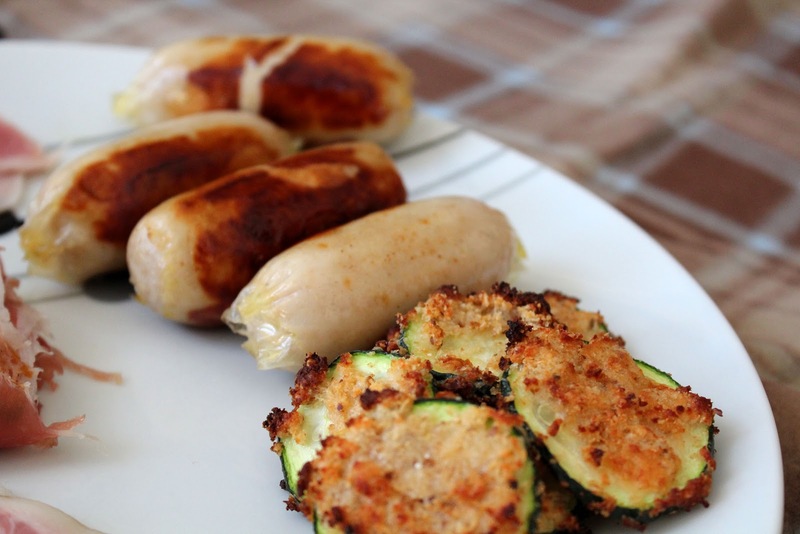 I added in the zucchini because I like some veggies - had I had any more roasted veggies from the pervious night I would also have thrown them in. I found this was a really great mix - there was plenty of flavour and I found the salty proscuitto went well with the Pecorino and turkish bread, while the ham and Gouda were a great match with some pear. The dessert plate was rather small, mostly because by this time I'm usually rather full. 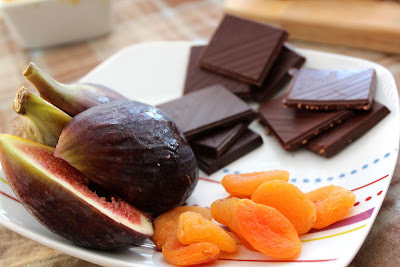 I find a mix of dried fruit (apricots), real fruit (something sweet, like figs) and hard, dark chocolate, go well together. Here we have three different type of Lindt Excellence chocolate - 70% cocoa, strawberry intense and coconut intense. And believe it or not, Lindt did not sponser this post, I was just really excited about the chocolate. 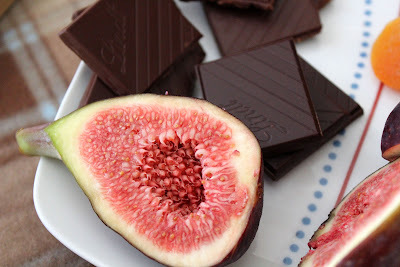 I cannot go past sweet fruit and dark chocolate - such a great mix. So really antipasti and snack plates can be anything - and hell, all of these plates make a great dinner or picnic lunch. I just chose my favourite foods and combined them. I try to pick cheeses and meats that go well with hard fruits like pears, and aim for sweeter fruits to pair with dark chocolate for dessert. If I was having a caramel or sweet chocolate for dessert, I might have gone for dried fruit like apples or maybe even chopped apples as my real fruit. But I'm no expert and I've tried really hard to not sound like a total tool in this post. It's really just a combination of my favourite things and I thought it might inspire some ideas for you guys for future snack / antipasti plates. So happy eating! P.S. Finally updated my About Me page. gosh that all looks so good. I adore snack plates. That all looks soo good - this is the kinda food I could never get sick of. You sound like you are truly lucky - where are you going for your overseas trip?